Treating both heroin addicts and metastatic lung cancer patients used to rely as much on trial and error as on hard science. As a result of adopting evidence-based best practices, the treatment lung cancer patients receive has improved drastically in recent years. To help us imagine what the future of addiction treatment could look like, let’s compare the treatment a typical lung cancer patient would receive today versus 10 years ago. We’ll call our patient Jessica. In 2007, Jessica was a mom and teacher who competed in ballroom dancing several times a year. Only 51, she looked forward to being active for several more decades until a cluster of frightening lymph nodes began to grow on her neck. Her worst fears were confirmed when blood tests and computed tomography (CT) scans revealed a classic case of metastatic lung cancer. What followed was distressing: as her oncologist tried one chemotherapy regiment after another, Jessica continued to get worse. And a Google search disclosed a stat that hit her like a sledgehammer – she had a five percent chance of surviving beyond twelve months of her prognosis. The future looked bleak. If Jessica’s cancer waited until 2017 to appear, however, her treatment would be radically different. Lung cancer specialists today are able to take advantage of a new field of directed chemotherapy called “assay-directed therapy”. Instead of guessing which highly toxic standard chemotherapy combinations might work for a particular patient, oncologists can determine which specific drugs are most likely to kill a patient’s precise type of cancer cells! No more blind trial and error. Instead of guessing at which toxic chemicals to try first, Jessica’s oncologist could compare the profile of her cancerous cells to those in national databases and learn which treatments have had the best response rates. The chances are good that Jessica’s first round of treatment would shrink her cancerous cells until they are barely discernible under the microscope and that they could eventually be made to disappear altogether. Wouldn’t it be exciting to be able to make similar improvements in addiction treatment? Perhaps 10 years from now, clinicians will be able to tailor their treatment based upon what has proven most effective for patients with similar co-occurring disorders, demographic profiles, and/or substance use histories. While treating addiction will never be as predictable as treating a physical disease because of the emotional and motivational complexities unique to each patient, it’s quite possible we could use data to choose the treatment particulars most likely to help each addict fight their insidious disease. In addition, the presence of hard data would start to shift the balance of power from payers to treatment professionals in arguing for specific treatment modalities and lengths of stay. We are starting to build this database of knowledge. Vista Research Group provides inexpensive online progress monitoring to treatment centers that screens patients for co-occurring disorders and provides their clinicians with real-time monitoring of the severity of their symptoms. Vista also follows up with certain patients for at least one year after treatment to learn how successful they’ve been at staying clean and sober as well as how treatment has affected their quality of life. 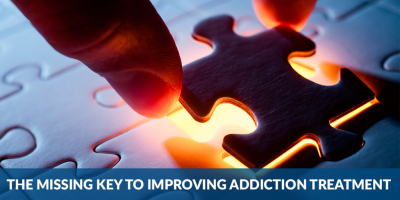 Learn how effective your program is for different types of patients and work together with other innovative leaders to advance our knowledge of addiction treatment. Contact Joanna Conti at jconti@vista-research-group.net or (410) 757-2811 to join the movement to true evidence-based treatment.